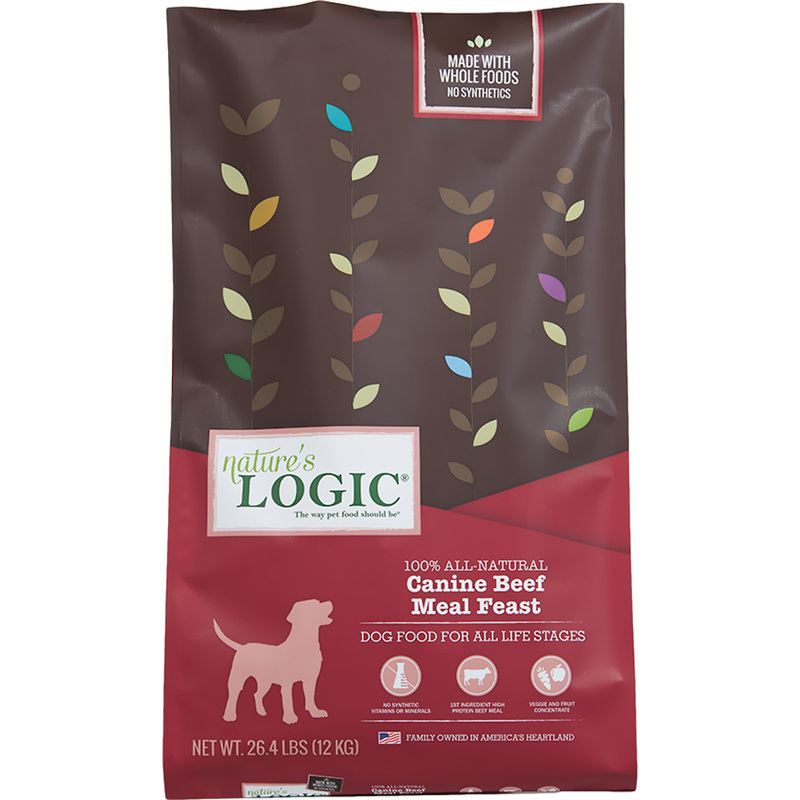 Nature's Logic® Dry Beef for Dogs is a delectable nutrient dense dry food that your dog will absolutely love. This food formula is free of gluten and packed with probiotics and enzymes that work to aid in your dog's digestion. This food is also free of synthetic vitamins or minerals and contains only natural nutrients selected to provide comprehensive nutrition to your pet. Nature's Logic Dry Beef for Dogs is formulated for all life stages of dogs and uses 100% natural ingredients. This bag contains 26.4 pounds of a delectable beef formula, but it is also available in a scrumptious chicken flavor. Feed your dog a food that meets all their nutritional needs and order Nature's Logic dry food today. Ingredients: Beef Meal, Millet, Chicken Fat (preserved with Mixed Tocopherols), Pumpkin Seed, Yeast Culture, Spray Dried Pork Liver, Alfalfa Nutrient Concentrate, Montmorillonite Clay, Dried Kelp, Spray Dried Lamb Plasma, Dried Tomato, Almonds, Dried Chicory Root, Dried Carrot, Dried Apple, Menhaden Fish Meal, Dried Pumpkin, Dried Apricot, Dried Blueberry, Dried Spinach, Dried Broccoli, Dried Cranberry, Parsley, Dried Artichoke, Rosemary, Dried Mushroom, Dried Lactobacillus acidophilus Fermentation Product, Dried Lactobacillus casei Fermentation Product, Dried Bifidobacterium bifidium Fermentation Product, Dried Enterococcus faecium Fermentation Product, Dried Bacillus coagulans Fermentation Product, Dried Pineapple Extract, Dried Aspergillus niger Fermentation Extract, Dried Aspergillus oryzae Fermentation Extract, Dried Trichoderma longibrachiatum Fermentation Extract. Cellulase* (Trichoderma Longibrachtum) 82.5 µg Glucose liberated/min/kg.